I think the FOTN soundtrack is my favourite. It begins on a mysterious note with The Prophecy, then moves on to the cheerful Concerning Hobbits. Then things get serious again with The Shadow of the Past, as the movie progresses with the history of the Ring. The lovely Enya has one and a half tracks on this CD. Below are some comments on each track of this CD. There are some SPOILERS so I have selected my comments in red so that you can skip them if you want. 2. Concerning Hobbits - The first time the hobbit theme appears. 3. The Shadow of the Past - When Gandalf is telling Frodo about the Ring, how could things not get spooky? First appearance of the Mordor theme (or was that in The Prophecy?). 4. The Treason of Isengard - This one starts off at a soft note as Frodo and Sam start off (more Hobbit theme music). Then the music gets more "epic" as Gandalf rides to Isengard. 5. The Black Rider - Dare I to say that this track starts on an almost silly note? Well, it's Pippin and Merry out-of-the-blue appearance time! You can definitely hear the rolling-down-the-hill part in the music. Of course, the title suggest a Black Rider - so of course the music is not silly and happy for long. 6. At the Sign of the Prancing Pony - I can just imagine the hobbits gazing fearfully into the faces of strange, tall men. 7. A Knife in the Dark - Yes, it's dark. Hint: It has something to do with a Nazgul sword. 8. Flight to the Ford - Arwen to the rescue! 9. Many Meetings - Things are happy again and the Hobbit theme prevails in Rivendell. 10. The Council of Elrond - This lovely track starts with Enya's beautiful "Aniron" ("I Desire" in Elvish). Here, the Hobbit theme changes into the Fellowship theme. 11. The Ring Goes South - As the Fellowship start on their quest, the Fellowship theme comes along with them. 12. A Journey In the Dark - This is one of the great masterpieces of this soundtrack. End of story. 14. Lothlorien - I like this track because it's so unique from all the others on this CD. 15. The Great River - I sometimes confuse this track with Amon Hem (amazing, right?) because I haven't listened to either track all that much. I had to give this an extra number because I love this CD so much. I have played it the most of all my LOTR CDs. I love the LOTR soundtrack also. :) It is my second favorite soundtrack after Star Wars. 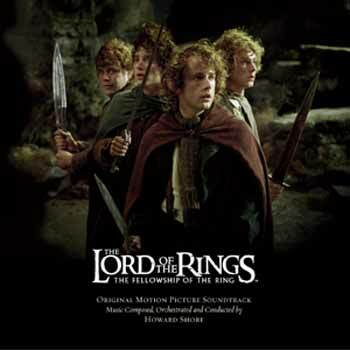 I am not sure which of the LOTR movie's soundtrack is my favorite but FOTR porbably has the memorable.